Improve visual inspections and improve Quality Control with this easy to use portable digital and video inspection microscope system. Take this camera microscope in your hand and touch it directly onto any object or surface. Then watch the live color video image on the screen and present it to a whole group simultaneously. Just by touching the sample with the internally lit lens tip, you are instantly focusing, illuminating, and magnifying to the screen. Capture still pictures, video movies and time lapse movies. 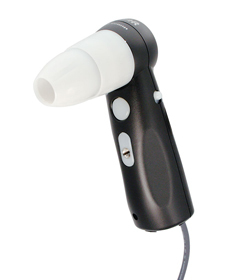 The ProScope HR2 is small and light and easy to move around, allowing visual inspection and quality control with this digital video microscope camera just about anywhere; it is completely portable on a laptop computer. The ProScope HR2 is unique among our other products because it is the lowest priced high resolution USB version device at 2 mega pixels. Capture high quality images and movies directly to your computer at magnifications from 1x up to 400x (lenses are shared with the Scope On A Rope™ L2). This inexpensive inspection microscope system will improve any quality control program.